EcoClean uses a water-based process known as wet cleaning to clean almost anything that can be dry cleaned. Wet cleaning uses water, specialized biodegradable detergents, and state-of-the-art equipment to leave garments soft to the touch with no chemical odor or residue. Wet cleaning gets clothes cleaner, and it’s safer for both humans and the environment than traditional dry cleaning. Almost all dry cleaners in Austin do traditional dry cleaning, which is not at all an eco-friendly dry cleaning method. Are you wondering, "Where can I find a safer alternative to dry cleaners near me?" Our suit dry cleaning is second to none and our laundry service in Austin provides the most environmentally safe method for cleaner clothes. We also offer alterations in Austin, TX at our EcoClean locations. Hate doing laundry? EcoClean wash and fold in Austin has got you covered. Items are washed in environmentally friendly detergents in our standard washing machines, tumble dried and then folded. This Austin laundry service is available as walk-in and delivery. Like other Austin laundromats, EcoClean provides wash & fold service for $2.00 per pound. Do you want a more convenient way to schedule your dry cleaning? Check out our dry cleaner app, available on iOS or Android! It is our mission to become the best and most innovative dry cleaners in Austin! We don’t want to toot our own horn, but our spot and stain removal service is unmatched. Customers tell us that we are often able to remove stains that have stumped other Austin dry cleaners. We inspect every garment to identify stains so we can make every effort to get them out. If you’ve got a question about a stain, bring in your garment for a consultation. Other dry cleaners in Austin cannot match our results. Ever notice that after being dry cleaned several times, your white clothes start to develop a yellowish color? (Hint: It’s from the yucky chemicals that dry cleaners in Austin use.) Don’t let that happen with your wedding gown. If you’ve already had your wedding dress dry cleaned, don’t fret. Wet cleaning, our eco-friendly dry cleaning method, will restore your wedding dress to its original white condition. Dry cleaners wedding dress capabilities are not created equal. You will see the difference with EcoClean. 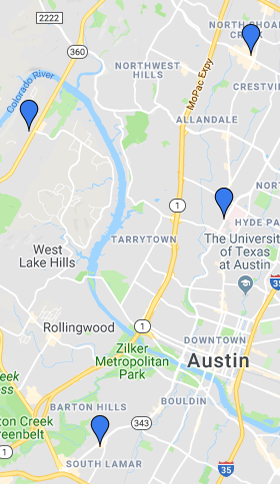 Looking for an Austin Dry Cleaner open on Sunday? Look no further. Our South Lamar, North Lamar and West Anderson locations are now open on Sundays from noon-5pm. EcoClean is happy to recycle all of your used dry cleaners hangers. Just bring them to our store or give them to your delivery driver. We’ve even got free “hanger caddy” boxes where you can store them. We value our reputation as a responsible cleaning service in Austin, TX. If you are in a rush, we can clean your item in just one day. EcoClean regularly offers a 24-hour dry cleaners service on request. Our normal turn around time on any item is 2 business days, but we will clean your item and have it ready by 5pm the next business day. This service is available upon request and for no extra charge. Just give us a heads up. Pair this service with the best delivery in Austin and you've got a winning combination! You bet we clean lapels. Lapels cleaners can be be hard to find, but EcoClean cleans lapels all the time.